Way back when Mr. Q and I were trying to figure out where to go on our vacation this year it was Mr. Q who stumbled across the cruise we ended up booking. 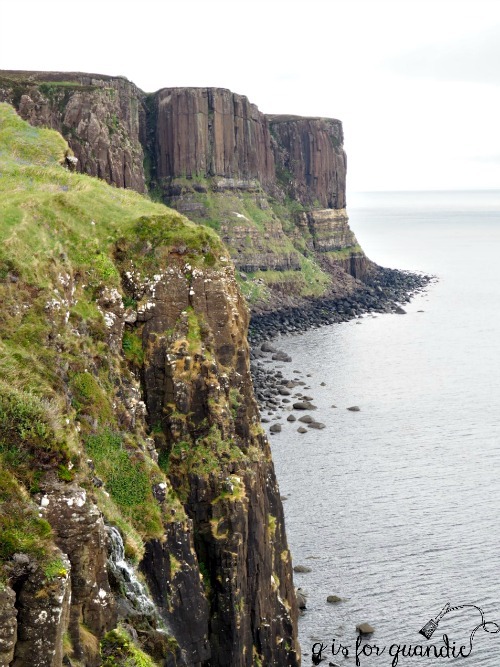 The main reason he was drawn to this particular itinerary was the stop at the Isle of Skye. 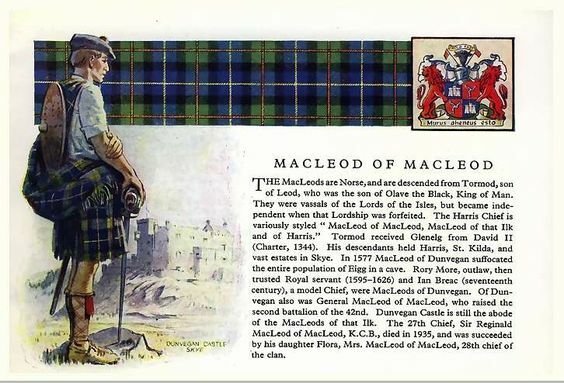 You see, Mr. Q’s step-dad is a McLeod. 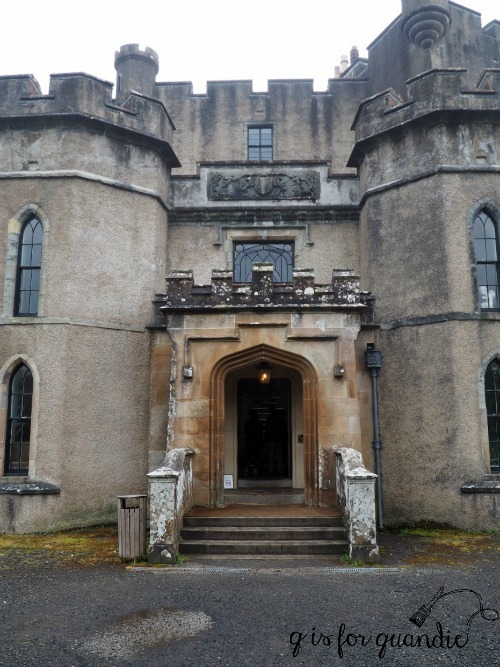 And Castle Dunvegan on the Isle of Skye is the seat of Clan McLeod. So you could say that this entire trip was planned around seeing Castle Dunvegan. And this is where my story takes a turn for the dark side. 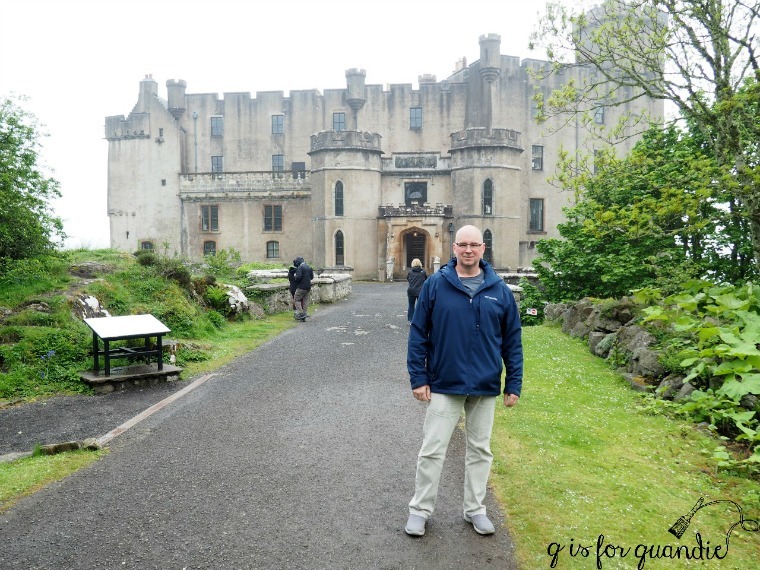 I made the decision to book an independent shore excursion to Castle Dunvegan with a company called Tour Skye (not to be confused with several other tour companies operating on Skye with similar names). I’ve booked shore excursions with independent companies before and always had good luck with them, so I wasn’t particularly worried about the fact that we had to pay in full in advance (and after all, we also paid for our ship sponsored excursions in full in advance as well). But when I couldn’t get the tour operator to commit to a specific start time for the tour I started to get a little nervous. Instead we were just told to get off the ship as soon as possible and we would be met at the pier. I understand where they are coming from on this. They are taking a group, and they want everyone to get off the ship as soon as possible while at the same time they don’t want people to be worried that the tour will leave without them if they aren’t the first people off the ship. Since this port requires a tender (that means the ship is anchored away from shore and you take a small life boat to the pier), it can take a while to get everyone off the ship. Sure enough, we were met at the pier as soon as we disembarked from our tender and we were told to walk up the hill to the town square and wait there for our entire group to be assembled. So far, so good, I thought. But what I didn’t realize was that our group of 8, all of whom were ready and waiting at the appropriate meeting point by 8:30 a.m. would be left waiting in the town square until 9:45 for our tour guide and van. It seemed as though our guide was responsible for getting all of the other tours organized and on their way before she could head out with us. Had we known how long we would be waiting, we could have walked around Portree and at least enjoyed a little of the town. Instead we sat in that square not knowing if our guide was going to show up in five minutes, or in 75 minutes. Turns out it was the latter. But we finally loaded into our van and headed off to see the Isle of Skye. It was a foggy, drizzly day, but I actually loved that. It was exactly the kind of weather I expected to find in Scotland and it gave everything a misty, mysterious air that was very romantic and lovely. As we drove along our guide explained that she was taking us to a scenic overlook, but we might not be able to see much in the fog. Sure enough, we pulled off the road and were surrounded by nothing but fog. We drove on to another site with a similar result. We drove to a third site, Kilt Rock, and this time we could see the view and it was lovely. But I was starting to wonder, when were we going to go to Castle Dunvegan? Did we somehow get on the wrong tour? 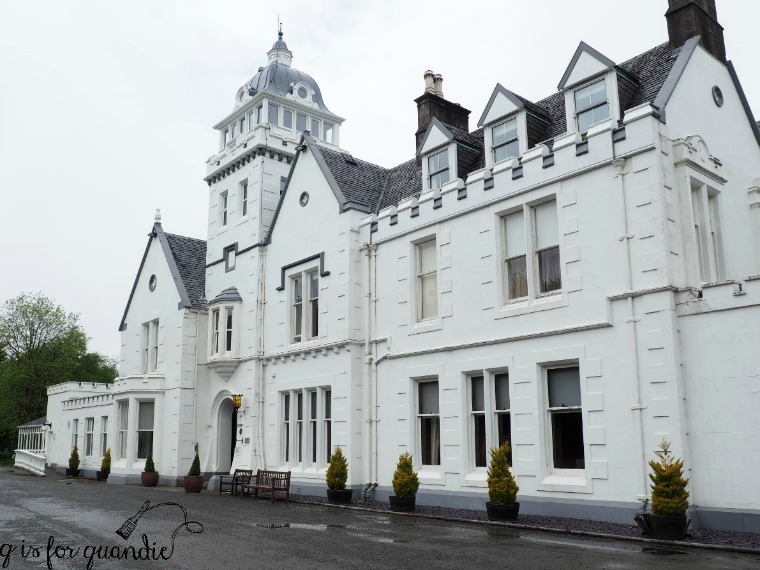 Our tour was supposed to include a morning stop at Castle Dunvegan, then a lunch stop where we would dine on “the very best of the Scottish cuisine”, followed by a “whiskey tasting experience” in the afternoon. After our late start it was already closing in on lunch time and we hadn’t even gotten to Dunvegan yet and the last tender to our ship was leaving at 3 pm so how were we possibly going to fit it all in? Our guide next drove us quite a long way down a harrowing single track lane in ever thickening fog to take us to the Fairy Glen. If you aren’t familiar with the concept of a single track lane, it is basically a narrow road that is only one car wide, but yet it isn’t a one-way road. Cars can travel either direction, but every so often there is a little spot where one car can pull off and let another pass. So, if you come upon another car and you aren’t near one of those spots, one of you has to back up until they can pull off. Cars are bad enough, but people drive camper vans down these roads. And trucks pulling trailers. It was quite the experience! But we made it to the Fairy Glen in one piece. 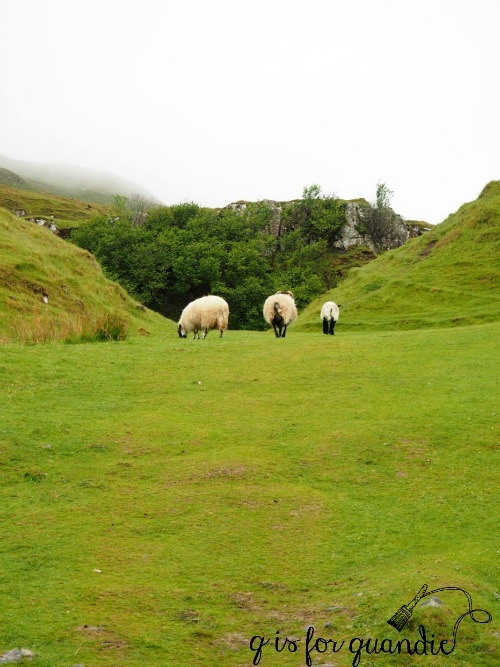 The Fairy Glen is made up of unique geological formations that were the result of a landslip. Or, as I prefer to believe, it was created by fairies and they may still live in ‘Castle Ewan’ (below) to this day. The Fairy Glen was beautiful and so unique, and it was perfect seeing it in the misty fog. Our lunch stop was at a lovely hotel, but I was surprised when asked if I preferred a ham sandwich or an egg/mayo sandwich. Huh? This is “the very best of the Scottish cuisine” that we were promised? A sandwich and some tomato soup. Underwhelming, to say the least. At this point it was about 1:30 in the afternoon. Everyone in our small group of 8 was wondering how in the world we were going to fit in a Dunvegan visit and a whiskey tasting and still make it back to our ship in time for the last tender. Our guide kept assuring us this was possible though, so I was shocked when I asked her how far away from the ship we were and she said about 40 minutes! By the time we pulled into the parking lot at Dunvegan it was 2 pm. And we were 40 minutes from the ship! It doesn’t take a rocket scientist to figure out at this point that not only are we not going to get to the whiskey tasting, but we are only going to have 20 minutes to see Dunvegan. Oh, and did I mention that our guide/driver hit a pedestrian with the van in the Dunvegan parking lot? Thank god the person wasn’t injured, just startled and rather pissed off. Dunvegan looked like a lovely place, what little we got to see of it. We took some really quick photos including one of Mr. Q in front of the castle so he could prove he really was there. 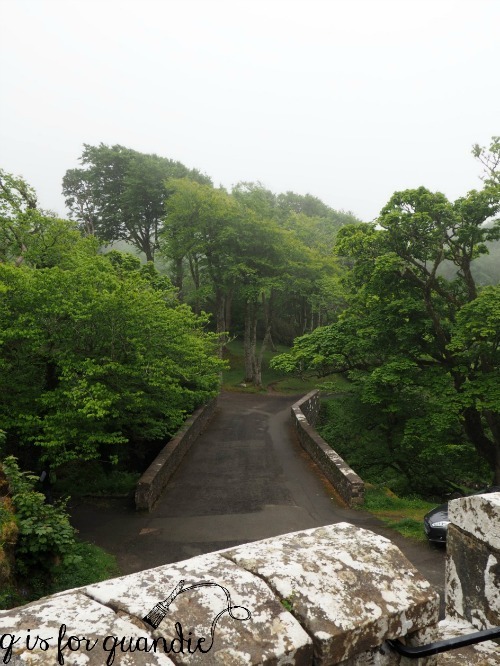 I felt just sick inside that we were standing right there at Dunvegan castle, but we were going to have to race through it and not see much. I had this experience once before at Versailles and I am still bitter about it years later. The quick glimpse I got of the gardens while running past them told me that I was missing out by not getting to see them at all. We basically dashed through the castle straight to the gift shop. We HAD to bring souvenirs back for Mr. Q’s step-dad. After making our purchase we literally had to run back to the van. What followed was a nail biting 40 minutes of dead silence as our guide drove us back to the port. Not a single person said a word that entire time including our guide. I think we were all wondering the same things, were we going to make it back in time? Would our ship really sail without us? Is the last tender at precisely 3 pm, or will there be another at 3:10 for the stragglers? How far is it to our next port of call if we miss the ship and have to get there on our own? I think I looked at my watch about 25 times during that ride. I kept thinking that surely the port was just around the next corner. We finally screeched to a halt at the pier at 2:58 p.m.
We all practically jumped out of that van and kissed the ground. The personnel from our ship were there to greet us and welcome us back on board the Zuiderdam with smiling faces. 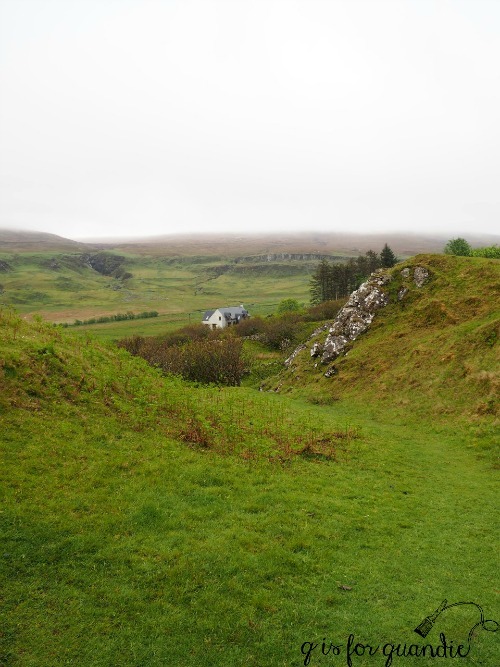 Upon our return home I sent an email to Robert at Tour Skye to express our dissatisfaction with the tour. Of course, that email as well as a 2nd email have fallen on deaf ears. I haven’t even received a reply, let alone an apology or remuneration of any kind. I don’t want to leave you with the impression that booking independent shore excursions is a mistake. As I mentioned at the beginning of this post, I’ve done this many times and never had a problem. I’ve also had equally bad experiences with ship sponsored shore excursions, like the time my tour bus caught on fire. The local tour guide told us to stay in our seats, even though the bus was on fire (obviously we ignored that instruction and everyone got off the bus!). We had to be rescued by another completely full tour bus from another cruise line, and then stand in the aisle of that bus all the way back to the ship. I didn’t get my money back from the cruise line for that excursion either! Although that time we did get to see all of the promised stops on our itinerary, they were just augmented by a potentially life threatening situation. Travel is always going to involve some glitches of course, but it’s so disappointing when people don’t live up to their promises and can’t even be bothered to apologize for it. 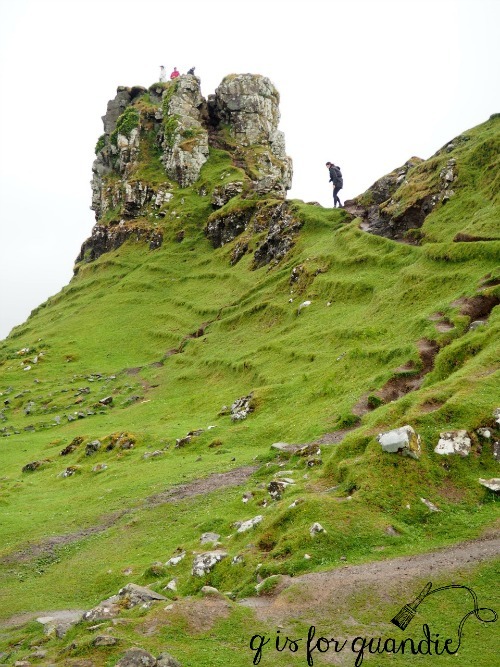 Perhaps Mr. Q and I will make it back to the Isle of Skye someday. If so, we’ll definitely do it differently next time! It really was a beautiful place and we’d like to see more of it. But let’s move on, shall we? It’s definitely time to put our bad experience with Tour Skye behind us. Be sure to come back next Wednesday to read about the opposite side of this coin, our fantastic experience in Invergordon with our private guide, Alda. Previous to paint or not to paint. If there were unforeseen circumstances that left them with ashortage of personnel or a valid explanation of their failure to be able to complete their offer with a discount seeing as you didn’t get all you paid for the wound would not be so deep. I hate it that your tour of the Castle was less than expected particularly when it was to be a highlight of your vacation. I think you are handling this with much more grace than I might. All that said Scotland is a beautiful place however for me the food was lackluster except for the bakery in Edinburgh ! Yes, an explanation and an apology would have been nice. It was a very disappointing day to say the least. But hey, if you say Scottish cuisine is lackluster then maybe the egg mayo sandwich and tomato soup really were ‘the best of Scottish cuisine’! Wow, that is really sad. I feel bad you didn’t get the time you really wanted at the castle. However, you will think of Scotland the next time ham or egg salad sandwich and tomato soup. True. And I will admit that the tomato soup was pretty good. Beautiful country, but so sad that it wasn’t all it could have been. I would love to visit Scotland one day, but until then your beautiful photos will be my inspiration. Thanks for the sheep photos, why are sheep so photogenic? Looking forward to your next post! 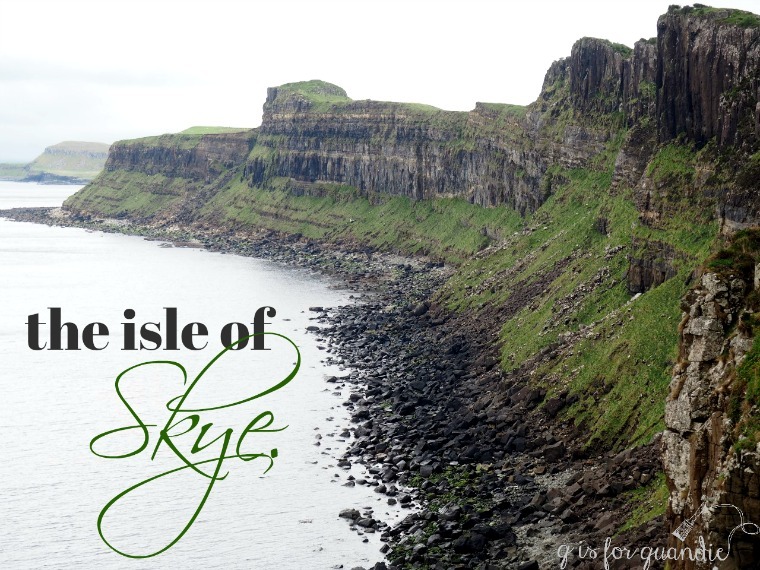 My husband and I lived in Scotland (Aberdeen on the northeast coast) for 3 1/2 years and the Isle of Skye was one of our favorite places. I’m sorry your excursion turned out like it did. I do have the to ask though, did you try haggis? I expected haggis to be on the menu for the ‘very best of Scottish cuisine’, but no, we got tomato soup instead! Otherwise I definitely would have tried just a tiny little taste 😉 I’m totally envious of your time in Scotland. I bet you were able to explore and see so much. 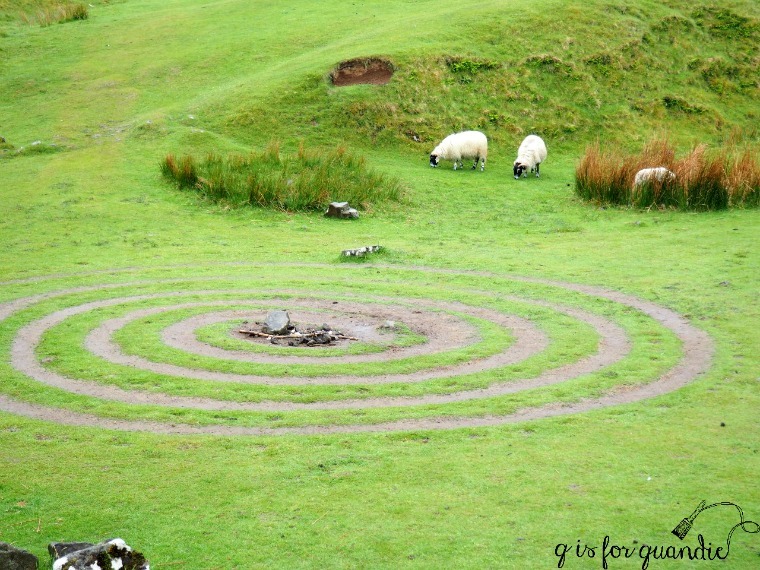 I’d love to go back to Scotland some day and see more of it.